1. Heat the oil in a large saucepan over a low heat. Add the garlic and gently fry until fragrant 2. Add the chicken, stock and 500ml (17fl oz) of water. Season well and sprinkle over the lemon zest. 3. Bring to the boil, reduce the heat and simmer for 10-12 minutes. 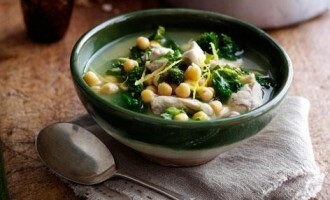 Add the kale and chickpeas, and then simmer for 2-3 minutes. 4. Stir in the lemon juice to taste and serve with crusty bread.